Written by torontoai on April 15, 2019 . Posted in Google. Written by torontoai on April 2, 2019 . Posted in Google. Recording video of memorable moments to share with friends and loved ones has become commonplace. But as anyone with a sizable video library can tell you, it’s a time consuming task to go through all that raw footage searching for the perfect clips to relive or share with family and friends. Google Photos makes this easier by automatically finding magical moments in your videos—like when your child blows out the candle or when your friend jumps into a pool—and creating animations from them that you can easily share with friends and family. In “Rethinking the Faster R-CNN Architecture for Temporal Action Localization“, we address some of the challenges behind automating this task, which are due to the complexity of identifying and categorizing actions from a highly variable array of input data, by introducing an improved method to identify the exact location within a video where a given action occurs. Our temporal action localization network (TALNet) draws inspiration from advances in region-based object detection methods such as the Faster R-CNN network. TALNet enables identification of moments with large variation in duration, achieving state-of-the-art performance compared to other methods, allowing Google Photos to recommend the best part of a video for you to share with friends and family. The first step in identifying magic moments in videos is to assemble a list of actions that people might wish to highlight. Some examples of actions include “blow out birthday candles”, “strike (bowling)”, “cat wags tail”, etc. We then crowdsourced the annotation of segments within a collection of public videos where these specific actions occurred, in order to create a large training dataset. We asked the raters to find and label all moments, accommodating videos that might have several moments. This final annotated dataset was then used to train our model so that it could identify the desired actions in new, unknown videos. The challenge of recognizing these actions belongs to the field of computer vision known as temporal action localization, which, like the more familiar object detection, falls under the umbrella of visual detection problems. Given a long, untrimmed video as input, temporal action localization aims to identify the start and end times, as well as the action label (like “blowing out candles”), for each action instance in the full video. 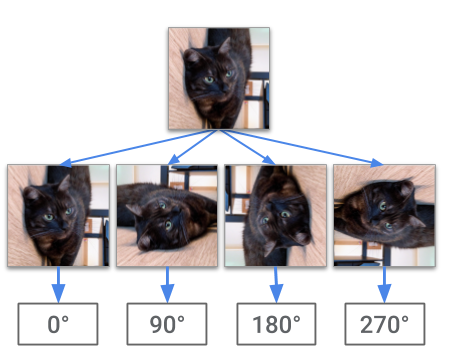 While object detection aims to produce spatial bounding boxes around an object in a 2D image, temporal action localization aims to produce temporal segments including an action in a 1D sequence of video frames. 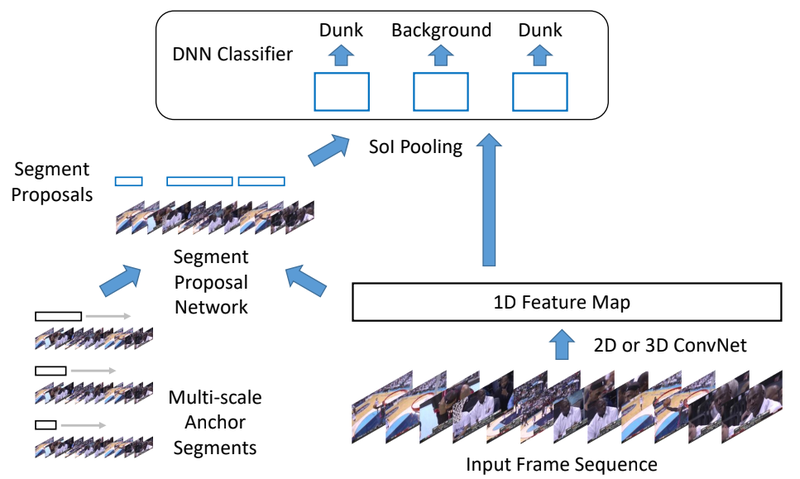 Our approach to TALNet is inspired by the faster R-CNN object detection framework for 2D images. So, to understand TALNet, it is useful to first understand faster R-CNN. The figure below demonstrates how the faster R-CNN architecture is used for object detection. 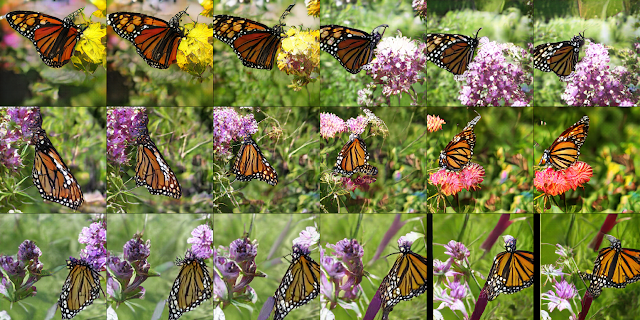 The first step is to generate a set of object proposals, regions of the image that can be used for classification. To do this, an input image is first converted into a 2D feature map by a convolutional neural network (CNN). The region proposal network then generates bounding boxes around candidate objects. These boxes are generated at multiple scales in order to capture the large variability in objects’ sizes in natural images. 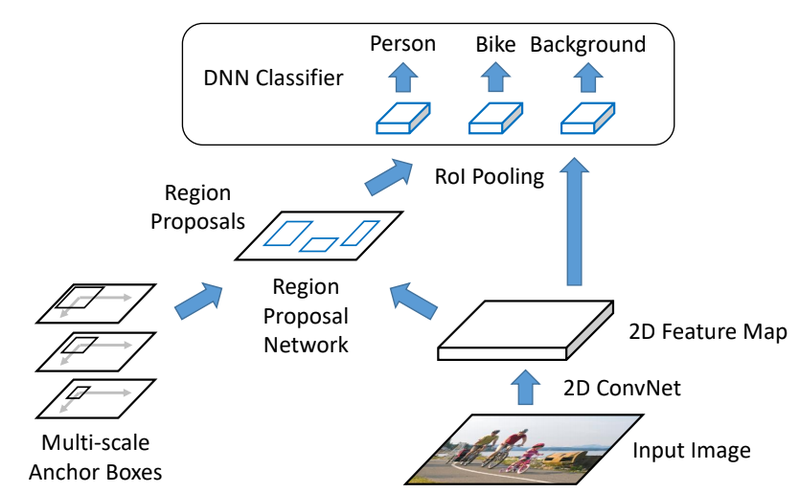 With the object proposals now defined, the subjects in the bounding boxes are then classified by a deep neural network (DNN) into specific objects, such as “person”, “bike”, etc. Temporal action localization is accomplished in a fashion similar to that used by R-CNN. A sequence of input frames from a video are first converted into a sequence of 1D feature maps that encode scene context. This map is passed to a segment proposal network that generates candidate segments, each defined by start and end times. A DNN then applies the representations learned from the training dataset to classify the actions in the proposed video segments (e.g., “slam dunk”, “pass”, etc.). 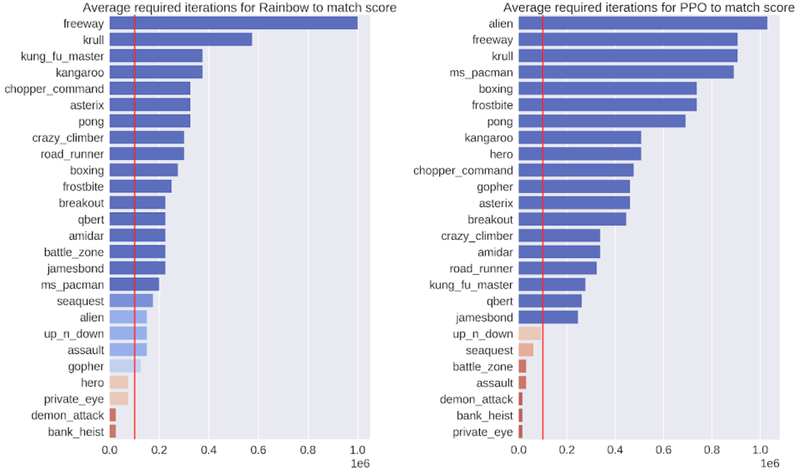 The actions identified in each segment are given weights according to their learned representations, with the top scoring moment selected to share with the user. The temporal extent of actions varies dramatically—from a fraction of a second to minutes. For long actions, it is not important to understand each and every frame of the action. Instead, we can get a better handle on the action by skimming quickly through the video, using dilated temporal convolutions. This approach allows TALNet to search the video for temporal patterns, while skipping over alternate frames based on a given dilation rate. Analysing the video with several different rates that are selected automatically according to the anchor segment’s length enables efficient identification of actions as large as the entire video or as short as a second. The moments preceding and following an action instance contain critical information for localization and classification, arguably more so than the spatial context of an object. Therefore, we explicitly encode the temporal context by extending the length of proposal segments on both the left and right by a fixed percentage of the segment’s length in both the proposal generation stage and the classification stage. As a consequence of these improvements, TALNet achieves state-of-the-art performance for both action proposal and action localization tasks on the THUMOS’14 detection benchmark and competitive performance on the ActivityNet challenge. Now, whenever people save videos to Google Photos, our model identifies these moments and creates animations to share. Here are a few examples shared by our initial testers. An example of the detected actions “jump into the pool” (left), “twirl in a dress” (center) and “feed baby a spoonful” (right). Written by torontoai on April 1, 2019 . Posted in Google. 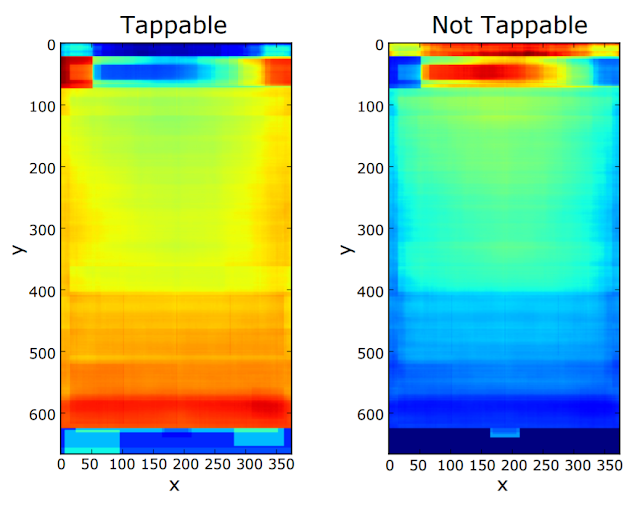 In our CHI’19 paper, “Modeling Mobile Interface Tappability Using Crowdsourcing and Deep Learning“, we introduced an approach for modeling the usability of mobile interfaces at scale. 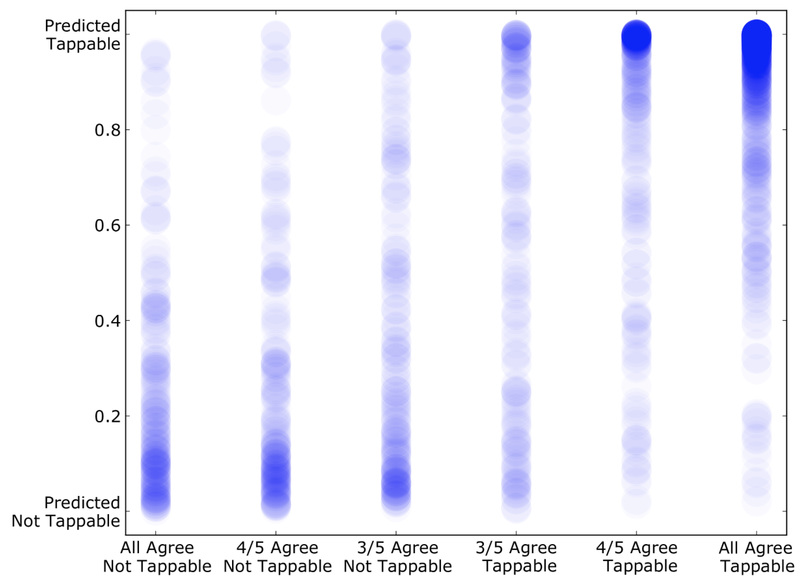 We crowdsourced a task to study UI elements across a range of mobile apps to measure the perceived tappability by a user. 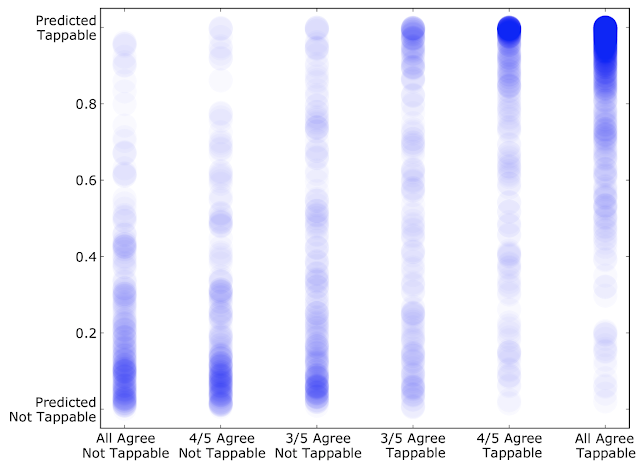 Our model predictions were consistent with the user group at the ~90% level, demonstrating that a machine learning model can be effectively used to estimate the perceived tappability of interface elements in their design without the need for expensive and time consuming user testing. We used these labels to train a simple deep neural network that predicts the likelihood that a user will perceive an interface element as tappable versus non-tappable. For a given element of the interface, the model uses a range of features, including the spatial context of the element on the screen (location), the semantics and functionality of the element (words and type), and the visual appearance (size as well as raw pixels). The neural network model applies a convolutional neural network (CNN) to extract features from raw pixels, and uses learned semantic embeddings to represent text content and element properties. The concatenation of all these features are then fed to a fully-connected network layer, the output of which produces a binary classification of an element’s tappability. The model allowed us to automatically diagnose mismatches between the tappability of each interface element as perceived by a user—predicted by our model—and the intended or actual tappable state of the element specified by the developer or designer. In the example below, our model predicts that there is a 73% chance that a user would think the labels such as “Followers” or “Following” are tappable, while these interface elements are in fact not programmed to be tappable. 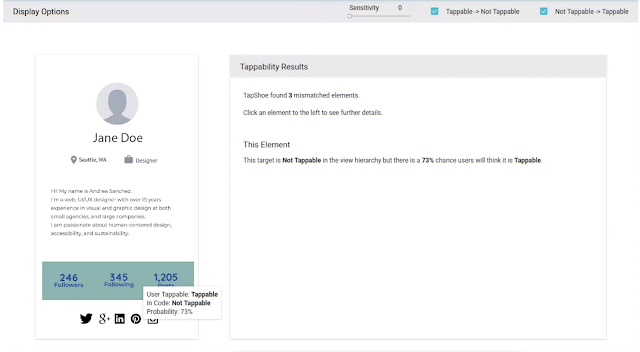 When users agree an element’s tappability, our model tends to give a more definite answer—a probability close to 1 for tappable and close to 0 for not tappable. When workers are less consistent on an element (towards the middle of the X axis), our model is also less certain about the decision. Overall, our model achieved reasonable accuracy of matching human perception in identifying tappable UI elements with a mean precision of 90.2% and recall of 87.0%. Written by torontoai on March 25, 2019 . Posted in Google. Written by torontoai on March 24, 2019 . Posted in Google. Written by torontoai on March 19, 2019 . Posted in Google. Written by torontoai on March 18, 2019 . Posted in Google. In “Measuring the Effects of Data Parallelism in Neural Network Training“, we investigate the relationship between batch size and training time by running experiments on six different types of neural networks across seven different datasets using three different optimization algorithms (“optimizers”). In total, we trained over 100K individual models across ~450 workloads, and observed a seemingly universal relationship between batch size and training time across all workloads we tested. We also study how this relationship varies with the dataset, neural network architecture, and optimizer, and found extremely large variation between workloads. Additionally, we are excited to share our raw data for further analysis by the research community. The data includes over 71M model evaluations to make up the training curves of all 100K+ individual models we trained, and can be used to reproduce all 24 plots in our paper. In an idealized data parallel system that spends negligible time synchronizing between processors, training time can be measured in the number of training steps (updates to the neural network’s parameters). Under this assumption, we observed three distinct scaling regimes in the relationship between batch size and training time: a “perfect scaling” regime where doubling the batch size halves the number of training steps required to reach a target out-of-sample error, followed by a regime of “diminishing returns”, and finally a “maximal data parallelism” regime where further increasing the batch size does not reduce training time, even assuming idealized hardware. 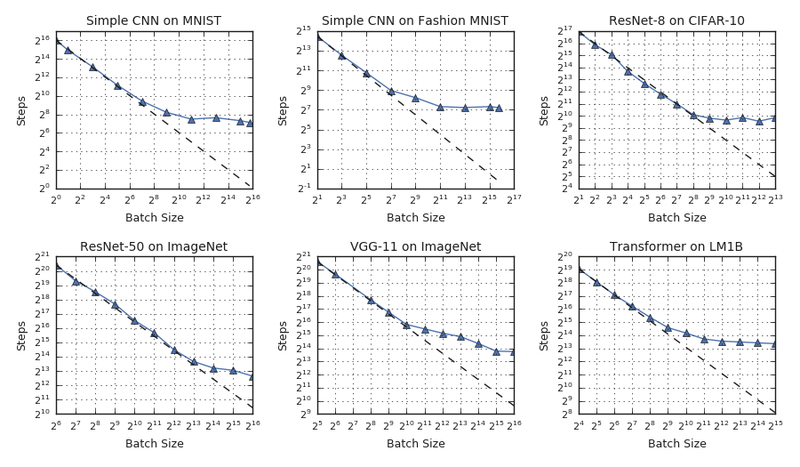 Although the basic relationship between batch size and training time appears to be universal, we found that the transition points between the different scaling regimes vary dramatically across neural network architectures and datasets. This means that while simple data parallelism can provide large speedups for some workloads at the limits of today’s hardware (e.g. Cloud TPU Pods), and perhaps beyond, some workloads require moving beyond simple data parallelism in order to benefit from the largest scale hardware that exists today, let alone hardware that has yet to be built. For example, in the plot above, ResNet-8 on CIFAR-10 cannot benefit from batch sizes larger than 1,024, whereas ResNet-50 on ImageNet continues to benefit from increasing the batch size up to at least 65,536. If one could predict which workloads benefit most from data parallel training, then one could tailor their workloads to make maximal use of the available hardware. 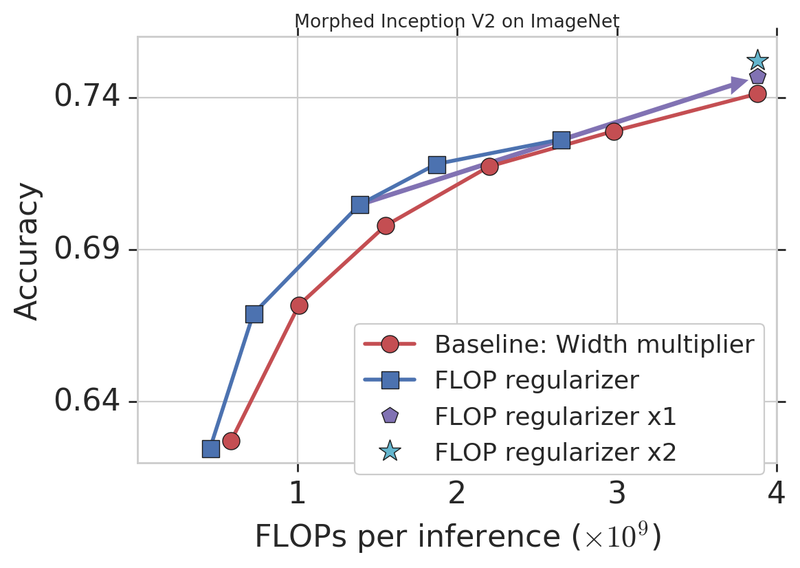 However, our results suggest that this will often not be straightforward, because the maximum useful batch size depends, at least somewhat, on every aspect of the workload: the neural network architecture, the dataset, and the optimizer. 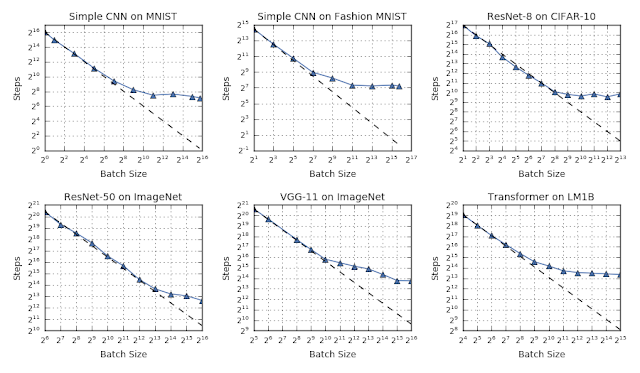 For example, some neural network architectures can benefit from much larger batch sizes than others, even when trained on the same dataset with the same optimizer. Although this effect sometimes depends on the width and depth of the network, it is inconsistent between different types of network and some networks do not even have obvious notions of “width” and “depth”. And while we found that some datasets can benefit from much larger batch sizes than others, these differences are not always explained by the size of the dataset—sometimes smaller datasets benefit more from larger batch sizes than larger datasets. Written by torontoai on March 17, 2019 . Posted in Google. 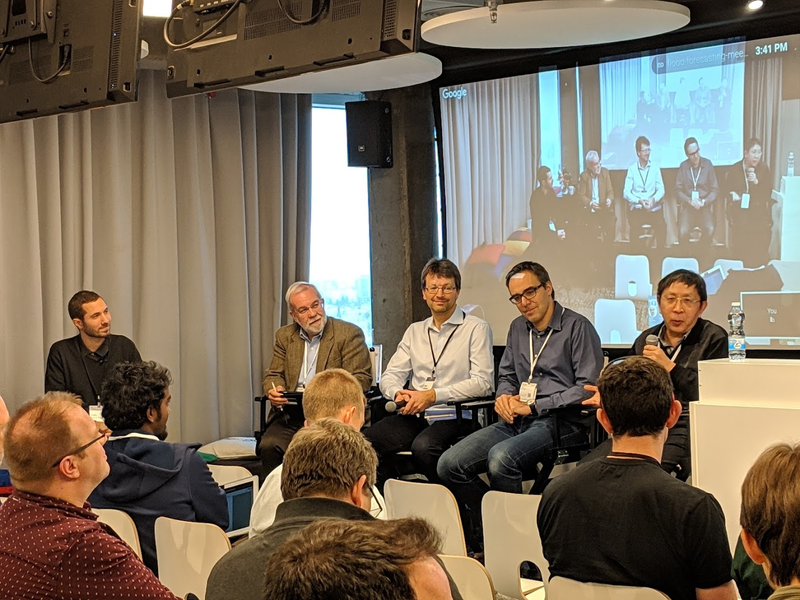 Recently, we hosted the Google Flood Forecasting Meets Machine Learning workshop in our Tel Aviv office, which brought hydrology and machine learning experts from Google and the broader research community to discuss existing efforts in this space, build a common vocabulary between these groups, and catalyze promising collaborations. In line with our belief that machine learning has the potential to significantly improve flood forecasting efforts and help the hundreds of millions of people affected by floods every year, this workshop discussed improving flood forecasting by aggregating and sharing large data sets, automating calibration and modeling processes, and applying modern statistical and machine learning tools to the problem. Panel on challenges and opportunities in flood forecasting, featuring (from left to right): Prof. Paolo Burlando (ETH Zürich), Dr. Tyler Erickson (Google Earth Engine), Dr. Peter Salamon (Joint Research Centre) and Prof. Dawei Han (University of Bristol). 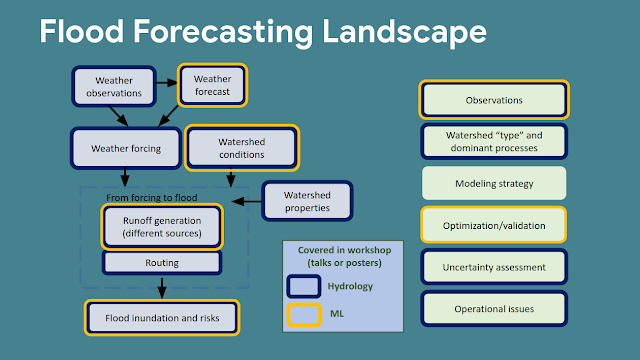 Included in the 2-day event was a wide range of fascinating talks and posters across the flood forecasting landscape, from both hydrologic and machine learning points of view. An overview of research areas in flood forecasting addressed in the workshop. Dr. Dhanya C. T. of IIT Delhi gave a talk on satellite precipitation error characterization. Adarsh M. S., Assistant Director of the Indian Ministry of Water Resources presented India’s Central Water Commission’s role and challenges. Prof. Andras Bardossy of the University of Stuttgart discussed variation in discharge series and the challenges this presents. Frederik Kratzert of Johannes Kepler University presented recent work on hydrologic modeling using LSTMs. Prof. Paul Bates of the University of Bristol gave a keynote on the potential uses of machine learning in inundation modelling. Prof. Emmanouil Anagnostou of the University of Connecticut spoke about hyper-resolution hydrologic simulations at global-scale. Prof. Efrat Morin of the Hebrew University highlighted flood prediction challenges in dry climate regions. Dr. Zachary Flamig of the University of Chicago presented NASA’s new global flash flood prediction project. Vova Anisimov presented our progress in hydraulic modeling. Ami Weisel presented our research on remote discharge estimation. Stephan Hoyer presented our work on data-driven discretization approach to solving partial differential equations. Jason Hickey presented our efforts using machine learning for precipitation prediction. Avinatan Hassidim presented lessons learned from previous projects in Google, and how they apply to our flood forecasting efforts. Additionally, at this workshop we piloted an experimental “ML Consultation” panel, where Googlers Gal Elidan, Sasha Goldshtein and Doron Kukliansky gave advice on how to best use machine learning in several hydrology-related tasks. Finally, we concluded the workshop with a moderated panel on the greatest challenges and opportunities in flood forecasting, with hydrology experts Prof. Paolo Burlando of ETH Zürich, Prof. Dawei Han of the University of Bristol, Dr. Peter Salamon of the Joint Research Centre and Dr. Tyler Erickson of Google Earth Engine. Flood forecasting is an incredibly important and challenging task that is one part of our larger AI for Social Good efforts. We believe that effective global-scale solutions can be achieved by combining modern techniques with the domain expertise already existing in the field. The workshop was a great first step towards creating much-needed understanding, communication and collaboration between the flood forecasting community and the machine learning community, and we look forward to our continued engagement with the broad research community to tackle this challenge. We would like to thank Avinatan Hassidim, Carla Bromberg, Doron Kukliansky, Efrat Morin, Gal Elidan, Guy Shalev, Jennifer Ye, Nadav Rabani and Sasha Goldshtein for their contributions to making this workshop happen.